Be a sponsor! Contact Wes & Jess ( moc.s1556009055tsitr1556009055aadem1556009055ala@t1556009055ra1556009055 ). Please use Summer Art Fair Sponsorship as the subject. Fair Sponsorship: Help promote your brand and the fair by subsidizing our extensive marketing efforts. IAA Live Stage Sponsorship: The IAA 501(c)(3) organization will bring live original performance to the fair this year. Media Sponsor: Donate ad space or co-branded advertising to help promote the fair. 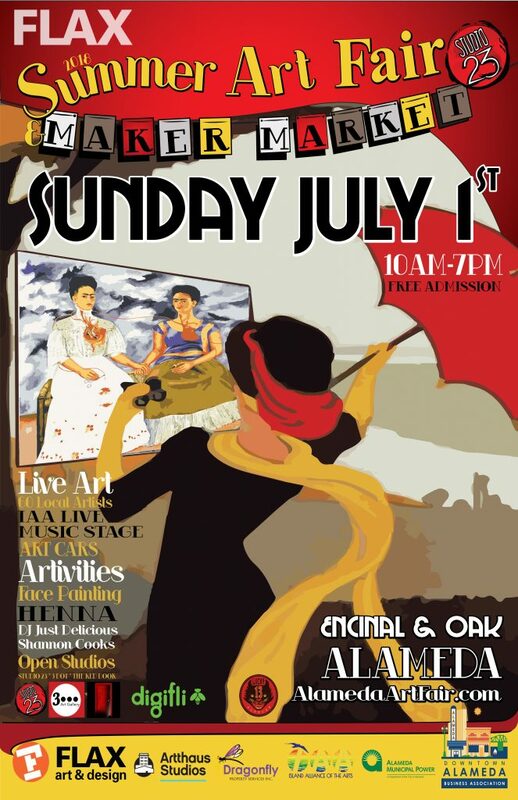 The fifth annual Summer Art Fair is proud to announce that we have been joined by the Island Alliance of the Arts to present even more wonderful original live performances for the fair. Traditional sponsorship packages are still available through Studio 23, these packages can be deducted as advertising expenses. 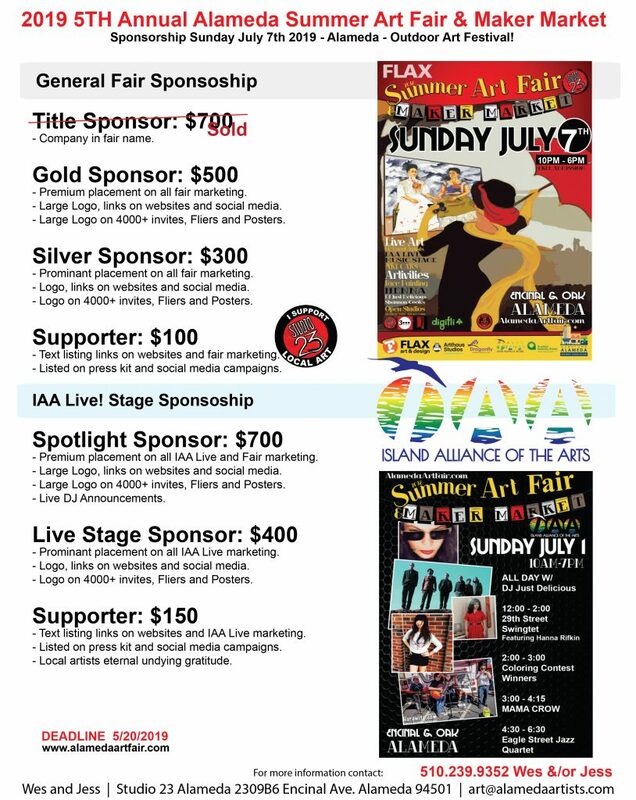 Sponsorship of the IAA Live Stage is done directly to the IAA a decades old 501(c)(3) non-profit arts organization here in Alameda. Do you have a newspaper or radio program? We need media sponsors! 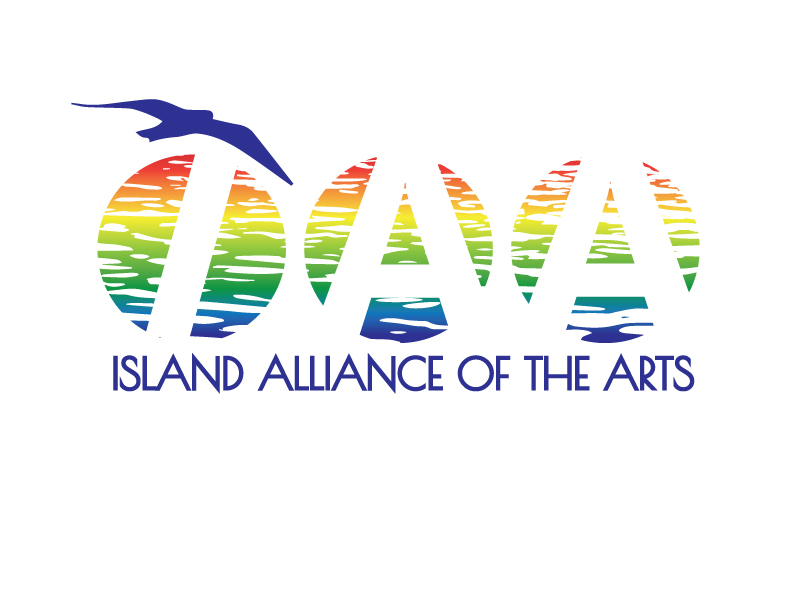 2019 Sponsors currently include: Flax (Title Sponsor), Digifli (media sponsor), Island Alliance of the Arts (Live Stage Sponsor). Alameda Summer Art Fair Sponsorship Incentives. Logo, links on websites and social media. Logo on 4000+ invites, Flyers and Posters. Large space on back on invites. Large banner space available at fair. Full table in Fair Sponsor / DJ booth. Logo and link included in email blasts. Digifli marketing campaign displayed throughout the east bay! Premier placement on all marketing. Premier placement of linked logo on website and social media. Large Logo on 4000+ invites, flyers, posters, banners. Medium banner space available at fair. Table space in Fair Sponsor / DJ booth. Logo, links on promo material, websites and social media. Logo on 4000+ printed invites, Flyers, and Posters. Inclusion in Press-Kit, small banner space at fair. – Shared table in Fair Sponsor / DJ booth. Org name listed on print media, link on website and social media. Inclusion in Press-Kit and social media campaigns. New Sponsorship Packages this year for the IAA Live stage! The IAA Live stage will have a parallel marketing initiative coordinated with the Art Fair marketing highlighting the IAA stage performance line up. These packages will provide the budget to pay the performers for this years fair. Your organization logo will be featured on all the fair marketing and be announced throughout the fair live performances. 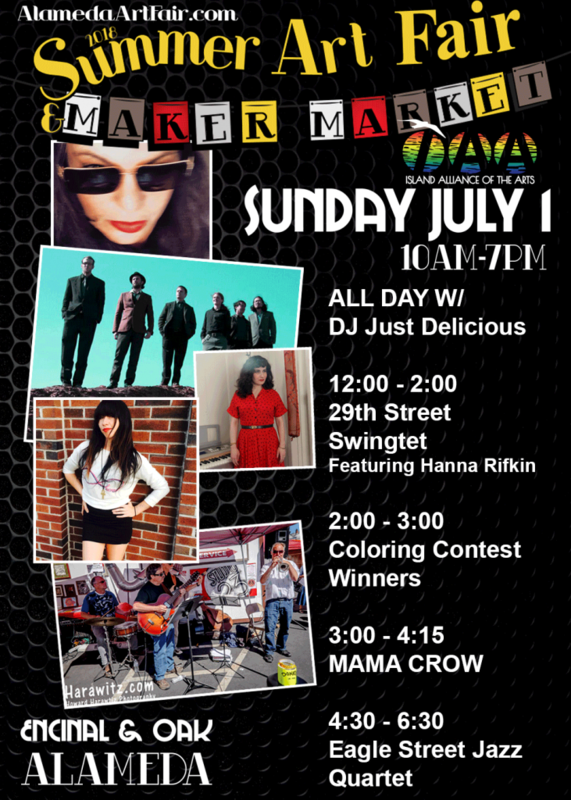 The IAA 501(c)(3) organization will bring live original performance to the fair this year. Announced throughout the fair live performances. Top exposure on all IAA Live Stage! marketing material and banners on the stage. 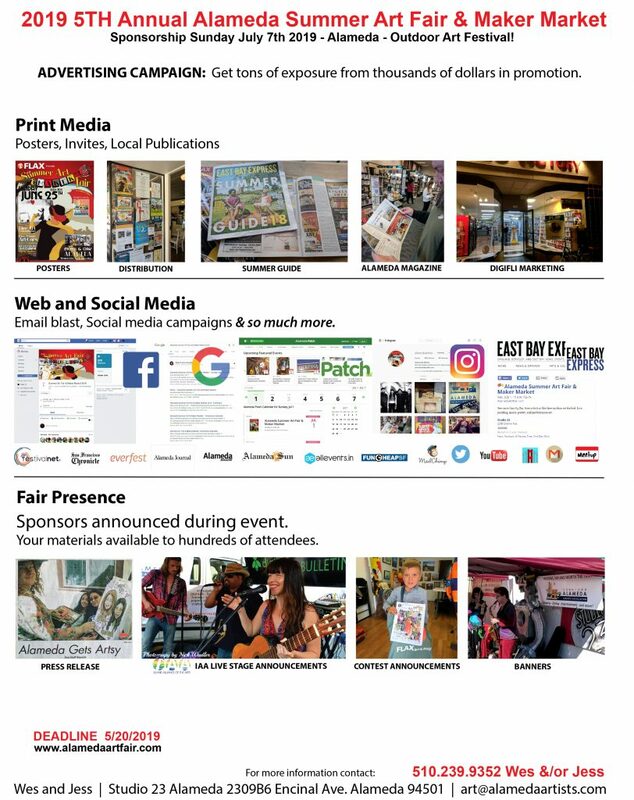 Silver Level Exposure on all fair marketing material. Prominent Exposure on all IAA Live marketing material. On thousands of printed invites and posters and social media and Digifli campaigns. Exposure on all IAA Live Stage! marketing material and banners on the stage. Exposure on all IAA Live marketing material.